ItemC-09274 - Indian Chiefs tomb and effigy. Fraser River, opposite New Westminster. His wife dying of hunger and starvation at the back of the shed." 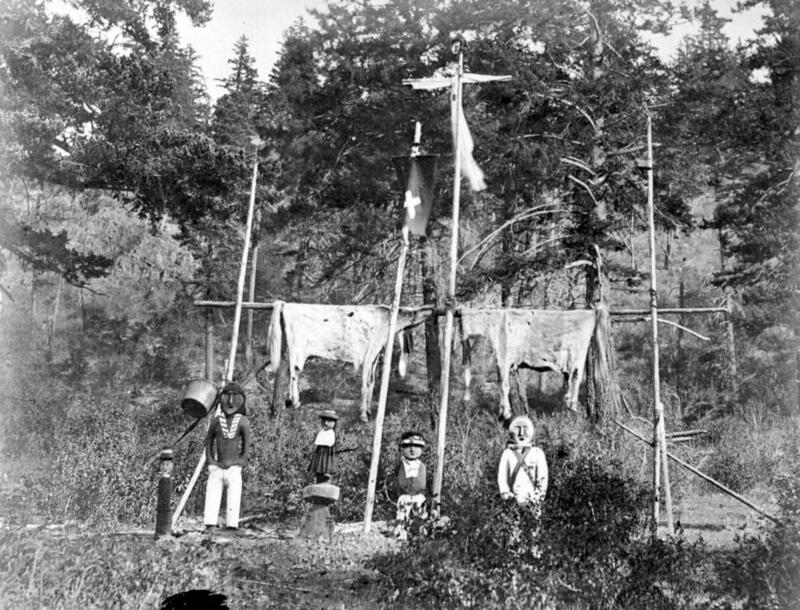 ItemC-09276 - Indian Chiefs Mausoleum at Yale, Fraser River, a great fisherman who was drowned when trying to land an enormous salmon. ItemC-09264 - Copper kettle, quite new with a hole through it. Horse skins for the life eternal. Horse skin for the happy hunting grounds. No white men There!!!!!! Indian Chiefs grave near Lytton. Fraser R.
ItemC-09270 - The kettles are for use in the happy hunting grounds. Zadoskis grave, with family monuments representing deceased members and relatives of the same. Fraser River. ItemF-08532 - Indian group, Fraser River. Tyhee Sizeanjute, Chief of the Bonaparte Tribe, wife, etc. Item C-09264 - Copper kettle, quite new with a hole through it. Horse skins for the life eternal. Horse skin for the happy hunting grounds. No white men There!!!!!! Indian Chiefs grave near Lytton. Fraser R.
Copper kettle, quite new with a hole through it. Horse skins for the life eternal. Horse skin for the happy hunting grounds. No white men There!!!!!! Indian Chiefs grave near Lytton. Fraser R.
MS-3100, Album 5, Page 30.